Save 20% to 50% on all our ski hire in Serre Chevalier. Booking Serre Chevalier ski hire equipment through us online is practical, easy and cheap. 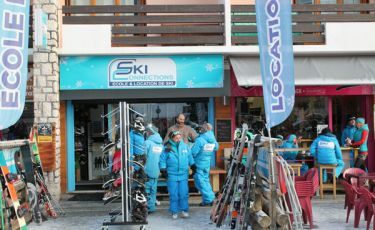 Welcome to Ski Connections, a one stop shop for all your Serre Chevalier ski hire and snowboard rental needs. 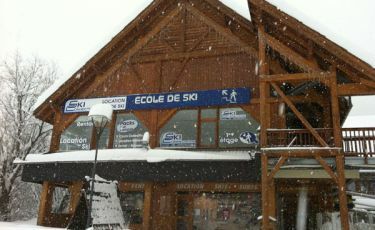 Ski Connections is not only a ski rental shop in Serre Chevalier1400 (Villeneuve), but it is also a Ski and Snowboard School. Our team of 3 Serre Chevalier Ski Hire Technicians and 20 instructors are here to help. They will provide you with a sound and professional service for your ski equipment rental needs in Serre Chevalier. Our promise to you is not only to provide you with skis that have been perfectly serviced, but to help you choose the skis you need for your ability level and skiing style. This service provides you with excellent value for money, as you do not spend money or time with equipment not suited to your needs. Book directly with Ski Connections online and save from 20% to 50% on your snowboard and ski hire in Serre Chevalier. WHY BOOK ONLINE WITH SKI CONNECTIONS? 20% to 50% discount on online bookings. An extra 5% off if you are already a customer of the ski shop or the ski school. An extra 5% off if your booking is over 300 €. A team of 3 ski technicians and 20 ski instructors at your disposal to advise you in your choices. Quality Serre Chevalier ski hire equipment well maintained by us and in our workshop. Shoes systematically dried and disinfected. Select and book your snowboard or ski hire in Serre Chevalier in advance. Get your equipment when you arrive in the resort. Only 10% deposit on booking. Our shop is located within the Pré Long commercial center, in the heart of Serre Chevalier, next to the tourist information office and right opposite the free car park.